The Fallglo can bring gorgeous color and bright, juicy tangerine flavor into your life while the fall leaves are still on the trees! The Fallglo is nice and big for a tangerine. It&apos;s so big that you might mistake it for an orange, in fact - although it&apos;s adorably plump and squat in the way that most tangerines are. The Fallglo has a striking, deep-orange peel. Sunshiny and sweet like all tangerines, the Fallglo Tangerine has a bright, rich tangerine taste. Fallglos are packed with juice and great for juicing! You&apos;ll be amazed by the vibrant orange hue. The Fallglo is a seeded citrus, but we think you won&apos;t mind a few seeds when you&apos;re enjoying these. Fallglo Tangerines are very popular for eating out of hand. They peel fast and easy and segment up beautifully. Everyone loves their sweet, juicy taste - especially children. The Fallglo gets to be first! It&apos;s our earliest-ripening tangerine, available from October through December. If you just can&apos;t wait for that first citrus of the year, or if you&apos;d like a gift basket of tangerines for your Thanksgiving table, the Fallglo is for you! Remember your fractions? You&apos;ll need to in order to understand the Fallglo&apos;s parentage. 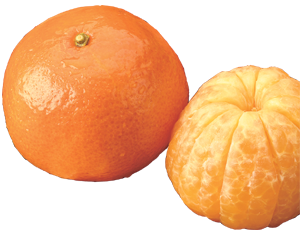 This fruit is actually ⅝ tangerine, ⅛ grapefruit, and ¼ orange. Since its qualities most strongly resemble a tangerine, though, that&apos;s how we refer to it. The word “tangerine” is derived from Tangier, a city on the coast of Morocco where tangerines have grown in abundance for hundreds of years. The Fallglo variety was created by the USDA in the 1960s in response to the desire for a delicious early-season tangerine. Citrus researchers in Orlando worked to perfect the variety and released it to be grown commercially in 1987.